Mystic Saddle Ranch is a family owned and operated company that has been offering guided horseback excursions since 1969. 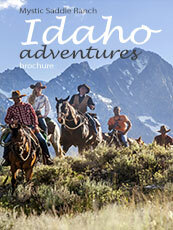 Max Bitton started Mystic in order to pursue his passion for horses and the outdoors of Idaho. 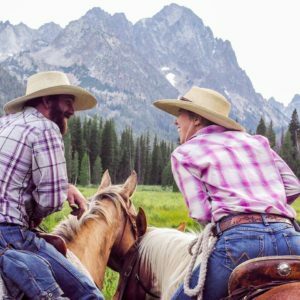 As the rules and regulations of the area changed, Mystic became an established outfitter, operating on a special use permit in the Sawtooth National Recreation Area and Sawtooth Wilderness. Max passed along his love of horses and outfitting to his only Son, Jeff who bought the company in 1980. Jeff and his wife grew the company in the years that followed. Mystic had now become a household name in the Sawtooth Valley. Families who had grown up riding horses at Redfish Lake or doing pack trips brought their families back to Stanley to share these same memories with an outfitter they trusted. In 2009, Jeff hired a young couple by the names of Mathew Cain and Rebekah Alseth. They instantly fell in love with the area and the company. Jeff mentored and nurtured those passions, encouraging them to pursue a life of guiding, hunting, fishing and outfitting. In the years that followed, Mathew became a certified farrier, Rebekah earned her bachelor’s degree and the two were married. In 2016, the Bitton family sold Mystic Saddle Ranch to Mathew and Rebekah Cain. The Cains vowed to run the company with the same strong values and to continue to uphold its spotless reputation within the community. Mathew and Rebekah also purchased a winter location from the Bittons and spend their winters in Arizona doing guided trail rides. The Cains share a passion for horses, hunting, fishing, guiding and meeting new people. They spend their time on the ground with their guides and horses, ensuring that their guests are getting the best possible experience. When they bought the business they knew they were purchasing much more than a way to earn a living, they were ensuring a lifestyle, one that they could be proud of.